Health Canada has suspended the distribution of two flu vaccine products from pharmaceutical giant Novartis and is telling those who administer the shots to hold off using the vaccine made by that company. The two flu vaccines being suspended are FluAd and AgriFlu. Novartis provides Canada with 20 per cent of its seasonal flu vaccine. Canada is following the lead of several European countries and suspending distribution of flu vaccine made by the pharmaceutical firm Novartis. The decision relates to the discovery by the company of tiny clumps of virus particles in some batches of flu vaccines made at the Novartis production facility in Italy. Saskatchewan has temporarily shut its public influenza immunization clinics in response to news about the Novartis products. "Our program will resume once the Health Canada review is completed," said Dr. Saqib Shahab, the province's chief medical health officer. The Public Health Agency of Canada indicates it has received no reports of unexpected adverse events related to these vaccines. Health Canada, which announced the move, said Novartis has agreed to suspend distribution of its vaccines — sold in Canada as Fluad and Agriflu — while the department investigates the situation. All the Novartis vaccine Canada purchases is made at the Italian plant. The department is also telling doctors and others who administer flu shots to hold off using Novartis product for the time being. "We think it's prudent, given the response of certain European countries to . . . request of Novartis — and they will be complying — to stop distributing and then to recommend to practitioners to refrain from using the (Novartis) vaccine just until this review is completed," Dr. Paul Gully, senior medical advisory for Health Canada, said Friday. 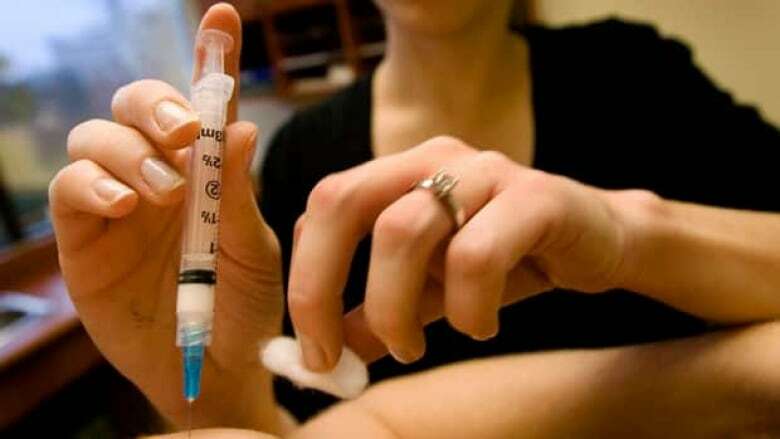 Dr. Allison McGeer, an infectious disease consultant at Toronto's Mount Sinai Hospital, told CBC News that people who have had the Novartis shots should not worry about adverse side effects. The worst she sees happening is the shot won't work as well as it should. McGeer stressed that the agency's move signals its tendency to be extra cautious when it comes to flu shots, and she feels people are in more danger from avoiding the flu shot than from having a Novartis shot. Health authorities in Italy, Germany and Switzerland have suspended distribution of some Novartis flu vaccine, and in the case of Germany recalled some lots of vaccine, after the clumping issue came to light. In a statement issued Friday night, the company said more than one million doses of its flu vaccines have been administered in Europe so far this season and no unexpected adverse events have been reported. As well, it said that it has already delivered about 70 per cent of its Canadian order (roughly 1.5 million doses), again without hearing of problems in people who have received Novartis flu shots. The company said people who have received Novartis flu shots are not at risk. Novartis said finding minute clumps of virus protein in vaccines is not unusual. They said their vaccines passed quality inspections and they are confident the products are safe. "We think that there's no adverse consequence, no side effects, because we do occasionally see [particles], so we want to find out exactly what the Europeans saw and why they took the decisions that they did," said Dr. Paul Gully, the senior medical advisor for Health Canada. "The aggregate proteins are predominantly influenza virus-derived (mainly hemagglutinin), all normal and necessary components of influenza vaccines," the company said. "Aggregation of these proteins is not unusual in vaccines manufacturing." Hemagglutinin is the protein on the outside of flu viruses that locks onto cells in the human respiratory tract to start the process of infection. Flu vaccines are designed to provoke the immune system to produce antibodies to hemagglutinin to protect against infection. In fact, this isn't the first time protein clumping has disrupted Canada's flu vaccine supply. During the 2009 pandemic, there was a delay in delivery of unadjuvanted vaccine for pregnant women when GlaxoSmithKline, Canada's pandemic vaccine supplier, found visible protein aggregation in some of the vaccine. Adjuvants are compounds that boost the response a vaccine generates. Canada used adjuvanted vaccine during the pandemic, but bought some unboosted product for pregnant women as a precaution. Novartis makes only about 20 per cent of Canada's annual flu vaccine purchase. GlaxoSmithKline makes the bulk of Canada's seasonal flu vaccine, though a variety of other suppliers have a share of the Canadian market. Still, because of the way vaccine orders are placed, the hold on Novartis vaccine could put some provinces and territories in a position where they face a temporary vaccine shortfall, just at the time when flu shot programs are getting underway, Gully admitted. He said Health Canada hopes there is a rapid resolution of the situation. But if provinces or territories have a problem with supply, efforts will be made to share across jurisdictions, he said. Both Fluad and Agriflu are sold in single-dose formulations, pre-loaded into a syringe. Fluad contains an adjuvant and is licensed for use in people 65 and older. Older adults do not mount a good response to flu vaccine and the inclusion of an adjuvant is an effort to improve the protection they get from flu shots.